Edison is considered one of the most prolific inventors in history, holding 1,093 U.S. patents in his name, as well as many patents in the United Kingdom, France, and Germany. He is credited with numerous inventions that contributed to mass communication and, in particular, telecommunications. His advanced work in these fields was an outgrowth of his early career as a telegraph operator. Edison originated the concept and implementation of electric-power generation and distribution to homes, businesses, and factories – a crucial development in the modern industrialized world. His first power station was on Manhattan Island, New York. Thomas Edison was born in Milan, Ohio, and grew up in Port Huron, Michigan. 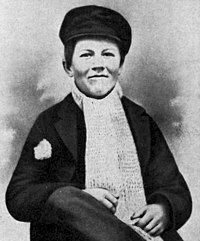 He was the seventh and last child of Samuel Ogden Edison, Jr. (1804–1896, born in Marshalltown, Nova Scotia, Canada) and Nancy Matthews Elliott (1810–1871). He considered himself to be of Dutch ancestry. In school, the young Edison's mind often wandered, and his teacher, the Reverend Engle, was overheard calling him "addled". This ended Edison's three months of official schooling. Edison recalled later, "My mother was the making of me. She was so true, so sure of me; and I felt I had something to live for, someone I must not disappoint." His mother homeschooled him. Much of his education came from reading R.G. Parker's School of Natural Philosophy and The Cooper Union. Edison developed hearing problems at an early age. The cause of his deafness has been attributed to a bout of scarlet fever during childhood and recurring untreated middle ear infections. Around the middle of his career Edison attributed the hearing impairment to being struck on the ears by a train conductor when his chemical laboratory in a boxcar caught fire and he was thrown off the train in Smiths Creek, Michigan, along with his apparatus and chemicals. In his later years he modified the story to say the injury occurred when the conductor, in helping him onto a moving train, lifted him by the ears. Edison's family was forced to move to Port Huron, Michigan, when the railroad bypassed Milan in 1854, but his life there was bittersweet. He sold candy and newspapers on trains running from Port Huron to Detroit, and he sold vegetables to supplement his income. This began Edison's long streak of entrepreneurial ventures as he discovered his talents as a businessman. These talents eventually led him to found 14 companies, including General Electric, which is still in existence and is the largest publicly traded company in the world. One of his mentors during those early years was a fellow telegrapher and inventor named Franklin Leonard Pope, who allowed the impoverished youth to live and work in the basement of his Elizabeth, New Jersey home. Some of Edison's earliest inventions were related to telegraphy, including a stock ticker. His first patent was for the electric vote recorder, (U. S. Patent 90,646), which was granted on June 1, 1869. Mary Edison died on August 9, 1884, possibly from a brain tumor. Charles Edison (1890–1969), who took over the company upon his father's death and who later was elected Governor of New Jersey. He also took charge of his father's experimental laboratories in West Orange. Theodore Edison (1898–1992), (MIT Physics 1923), had over 80 patents to his credit. 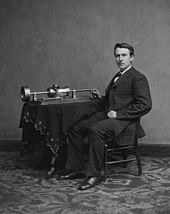 Thomas Edison began his career as an inventor in Newark, New Jersey, with the automatic repeater and his other improved telegraphic devices, but the invention which first gained him fame was the phonograph in 1877. This accomplishment was so unexpected by the public at large as to appear almost magical. Edison became known as "The Wizard of Menlo Park," New Jersey, where he lived. His first phonograph recorded on tinfoil around a grooved cylinder and had poor sound quality. The tinfoil recordings could be replayed only a few times. In the 1880s, a redesigned model using wax-coated cardboard cylinders was produced by Alexander Graham Bell, Chichester Bell, and Charles Tainter. This was one reason that Thomas Edison continued work on his own "Perfected Phonograph." Edison's major innovation was the first industrial research lab, which was built in Menlo Park, New Jersey. It was built with the funds from the sale of Edison's quadruplex telegraph. After his demonstration of the telegraph, Edison was not sure that his original plan to sell it for $4,000 to $5,000 was right, so he asked Western Union to make a bid. He was surprised to hear them offer $10,000, which he gratefully accepted. The quadruplex telegraph was Edison's first big financial success, and Menlo Park became the first institution set up with the specific purpose of producing constant technological innovation and improvement. Edison was legally attributed with most of the inventions produced there, though many employees carried out research and development work under his direction. His staff was generally told to carry out his directions in conducting research, and he drove them hard to produce results. The large research group included engineers and other workers. William J. Hammer, a consulting electrical engineer, began his duties as a laboratory assistant to Edison in December 1879. He assisted in experiments on the telephone, phonograph, electric railway, iron ore separator, electric lighting, and other developing inventions. However, Hammer worked primarily on the incandescent electric lamp and was put in charge of tests and records on that device. In 1880, he was appointed chief engineer of the Edison Lamp Works. In his first year, the plant under General Manager Francis Robbins Upton turned out 50,000 lamps. According to Edison, Hammer was "a pioneer of incandescent electric lighting". Nearly all of Edison's patents were utility patents, which were protected for a 17-year period and included inventions or processes that are electrical, mechanical, or chemical in nature. About a dozen were design patents, which protect an ornamental design for up to a 14-year period. As in most patents, the inventions he described were improvements over prior art. The phonograph patent, in contrast, was unprecedented as describing the first device to record and reproduce sounds. Edison did not invent the first electric light bulb, but instead invented the first commercially practical incandescent light. Several designs had already been developed by earlier inventors including the patent he allegedly purchased from Henry Woodward and Mathew Evans. Others who developed early and not commercially practical incandescent electric lamps included Humphry Davy, James Bowman Lindsay, Moses G. Farmer, William E. Sawyer, Joseph Swan and Heinrich Göbel. Some of these early bulbs had such flaws as an extremely short life, high expense to produce, and high electric current drawn, making them difficult to apply on a large scale commercially. In 1878, Edison applied the term filament to the element of glowing wire carrying the current, although the English inventor Joseph Swan had used the term prior to this. Swan developed an incandescent light with a long lasting filament at about the same time as Edison, but it lacked the high resistance needed for central station DC service. Edison took the features of these earlier designs and set his workers to the task of creating longer-lasting bulbs. By 1879, he had produced a new concept: a high resistance lamp in a very high vacuum, which would burn for hundreds of hours. 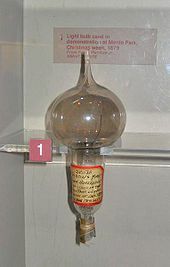 While the earlier inventors had produced electric lighting in laboratory conditions, dating back to a demonstration of a glowing wire by Alessandro Volta in 1800, Edison concentrated on commercial application, and was able to sell the concept to homes and businesses by mass-producing relatively long-lasting light bulbs and creating a complete system for the generation and distribution of electricity. In just over a decade Edison's Menlo Park laboratory had expanded to occupy two city blocks. Edison said he wanted the lab to have "a stock of almost every conceivable material". A newspaper article printed in 1887 reveals the seriousness of his claim, stating the lab contained "eight thousand kinds of chemicals, every kind of screw made, every size of needle, every kind of cord or wire, hair of humans, horses, hogs, cows, rabbits, goats, minx, camels ... silk in every texture, cocoons, various kinds of hoofs, shark's teeth, deer horns, tortoise shell ... cork, resin, varnish and oil, ostrich feathers, a peacock's tail, jet, amber, rubber, all ores ..." and the list goes on. Over his desk, Edison displayed a placard with Sir Joshua Reynolds' famous quote: "There is no expedient to which a man will not resort to avoid the real labor of thinking." This slogan was reputedly posted at several other locations throughout the facility. In 1877–1878, Edison invented and developed the carbon microphone used in all telephones along with the Bell receiver until the 1980s. After protracted patent litigation, in 1892 a federal court ruled that Edison—and not Emile Berliner—was the inventor of the carbon microphone. The carbon microphone was also used in radio broadcasting and public address work through the 1920s. After many experiments with platinum and other metal filaments, Edison returned to a carbon filament. The first successful test was on October 22, 1879; it lasted 40 hours. 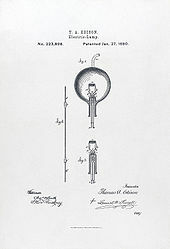 Edison continued to improve this design and by November 4, 1879, filed for U.S. patent 223,898 (granted on January 27, 1880) for an electric lamp using "a carbon filament or strip coiled and connected to platina contact wires". Although the patent described several ways of creating the carbon filament including "cotton and linen thread, wood splints, papers coiled in various ways", it was not until several months after the patent was granted that Edison and his team discovered a carbonized bamboo filament that could last over 1,200 hours. The idea of using this particular raw material originated from Edison's recalling his examination of a few threads from a bamboo fishing pole while relaxing on the shore of Battle Lake in the present-day state of Wyoming, where he and other members of a scientific team had traveled so that they could clearly observe a total eclipse of the sun on July 29, 1878, from the Continental Divide. Edison allegedly bought light bulb U.S. patent 181,613 of Henry Woodward that was issued August 29, 1876, and obtained an exclusive license to Woodward's Canadian patent. These patents covered a carbon rod in a nitrogen filled glass cylinder, and differed substantially from the first commercially practical bulb invented by Edison. On October 8, 1883, the U.S. patent office ruled that Edison's patent was based on the work of William Sawyer and was therefore invalid. Litigation continued for nearly six years, until October 6, 1889, when a judge ruled that Edison's electric light improvement claim for "a filament of carbon of high resistance" was valid. To avoid a possible court battle with Joseph Swan, whose British patent had been awarded a year before Edison's, he and Swan formed a joint company called Ediswan to manufacture and market the invention in Britain. Mahen Theatre in Brno in what is now the Czech Republic, was the first public building in the world to use Edison's electric lamps, with the installation supervised by Edison's assistant in the invention of the lamp, Francis Jehl. Earlier in the year, in January 1882 he had switched on the first steam generating power station at Holborn Viaduct in London. The DC supply system provided electricity supplies to street lamps and several private dwellings within a short distance of the station. On January 19, 1883, the first standardized incandescent electric lighting system employing overhead wires began service in Roselle, New Jersey. 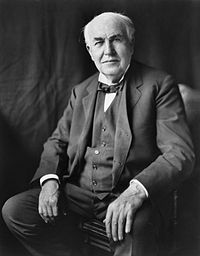 Edison's true success, like that of his friend Henry Ford, was in his ability to maximize profits through establishment of mass-production systems and intellectual property rights. George Westinghouse and Edison became adversaries because of Edison's promotion of direct current for electric power distribution instead of the more easily transmitted alternating current (AC) system invented by Nikola Tesla and promoted by Westinghouse. Unlike DC, AC could be stepped up to very high voltages with transformers, sent over thinner and cheaper wires, and stepped down again at the destination for distribution to users. In 1887 there were 121 Edison power stations in the United States delivering DC electricity to customers. When the limitations of Direct Current (DC) were discussed by the public, Edison launched a propaganda campaign to convince people that alternating current (AC) was far too dangerous to use. The problem with DC was that the power plants could economically deliver DC electricity only to customers within about one and a half miles (about 2.4 km) from the generating station, so that it was suitable only for central business districts. When George Westinghouse suggested using high-voltage AC instead, as it could carry electricity hundreds of miles with marginal loss of power, Edison waged a "War of Currents" to prevent AC from being adopted. Despite Edison's contempt for capital punishment, the war against AC led him to become involved in the development and promotion of the electric chair (using AC current) as an attempt to portray AC to have greater lethal potential than DC. Edison went on to carry out a brief but intense campaign to ban the use of AC or to limit the allowable voltage for safety purposes. As part of this campaign, Edison's employees publicly electrocuted animals to demonstrate the dangers of AC; AC electric currents are slightly more dangerous in that frequencies near 60 Hz have a markedly greater potential for inducing fatal "Cardiac Fibrillation" than do DC currents. On one of the more notable occasions, in 1903, Edison's workers electrocuted Topsy the elephant at Luna Park, near Coney Island, after she had killed several men and her owners wanted her put to death. His company filmed the electrocution. AC replaced DC in most instances of generation and power distribution, enormously extending the range and improving the efficiency of power distribution. Though widespread use of DC ultimately lost favor for distribution, it exists today primarily in long-distance high-voltage direct current (HVDC) transmission systems. Low voltage DC distribution continued to be used in high density downtown areas for many years but was eventually replaced by AC low-voltage network distribution in many of them. DC had the advantage that large battery banks could maintain continuous power through brief interruptions of the electric supply from generators and the transmission system. Utilities such as Commonwealth Edison in Chicago had rotary converters or motor-generator sets, which could change DC to AC and AC to various frequencies in the early to mid-20th century. Utilities supplied rectifiers to convert the low voltage AC to DC for such DC loads as elevators, fans and pumps. There were still 1,600 DC customers in downtown New York City as of 2005, and service was finally discontinued only on November 14, 2007. Most subway systems still are powered by direct current. Edison is credited with designing and producing the first commercially available fluoroscope, a machine that uses X-rays to take radiographs. Until Edison discovered that calcium tungstate fluoroscopy screens produced brighter images than the barium platinocyanide screens originally used by Wilhelm Röntgen, the technology was capable of producing only very faint images. The fundamental design of Edison's fluoroscope is still in use today, despite the fact that Edison himself abandoned the project after nearly losing his own eyesight and seriously injuring his assistant, Clarence Dally. Dally had made himself an enthusiastic human guinea pig for the fluoroscopy project and in the process been exposed to a poisonous dose of radiation. He later died of injuries related to the exposure. In 1903, a shaken Edison said "Don't talk to me about X-rays, I am afraid of them." Frank J. Sprague, a competent mathematician and former naval officer, was recruited by Edward H. Johnson and joined the Edison organization in 1883. One of Sprague's significant contributions to the Edison Laboratory at Menlo Park was to expand Edison's mathematical methods. Despite the common belief that Edison did not use mathematics, analysis of his notebooks reveal that he was an astute user of mathematical analysis conducted by his assistants such as Francis Upton, for example, determining the critical parameters of his electric lighting system including lamp resistance by a sophisticated analysis of Ohm's Law, Joule's Law and economics. Another of Edison's assistants was Nikola Tesla, to whom Edison promised $50,000 if he succeeded in making improvements to his DC generation plants. Several months later, when Tesla had finished the work and asked to be paid, Edison said, "When you become a full-fledged American you will appreciate an American joke." Tesla immediately resigned. With Tesla's salary of $18 per week, the payment would have amounted to over 53 years' pay and the amount was equal to the initial capital of the company. Tesla resigned when he was refused a raise to $25 per week. Although Tesla accepted an Edison Medal later in life, this and other negative series of events concerning Edison remained with Tesla. The day after Edison died, the New York Times contained extensive coverage of Edison's life, with the only negative opinion coming from Tesla who was quoted as saying, "He had no hobby, cared for no sort of amusement of any kind and lived in utter disregard of the most elementary rules of hygiene" and that, "His method was inefficient in the extreme, for an immense ground had to be covered to get anything at all unless blind chance intervened and, at first, I was almost a sorry witness of his doings, knowing that just a little theory and calculation would have saved him 90% of the labour. But he had a veritable contempt for book learning and mathematical knowledge, trusting himself entirely to his inventor's instinct and practical American sense." It seems very likely that Tesla's description was accurate, considering one of Edison's famous quotes regarding his attempts to make the light globe: "If I find 10,000 ways something won't work, I haven't failed. I am not discouraged, because every wrong attempt discarded is another step forward". When Edison was a very old man and close to death, he said, in looking back, that the biggest mistake he had made was that he never respected Tesla or his work. There were 28 men recognized as Edison Pioneers. Edison's favourite movie was The Birth of a Nation. He thought that talkies had "spoiled everything" for him. "There isn't any good acting on the screen. They concentrate on the voice now and have forgotten how to act. I can sense it more than you because I am deaf." Edison moved from Menlo Park after the death of Mary Stilwell and purchased a home known as "Glenmont" in 1886 as a wedding gift for Mina in Llewellyn Park in West Orange, New Jersey. In 1885, Thomas Edison bought property in Fort Myers, Florida, and built what was later called Seminole Lodge as a winter retreat. Edison and his wife Mina spent many winters in Fort Myers where they recreated and Edison tried to find a domestic source of natural rubber. Henry Ford, the automobile magnate, later lived a few hundred feet away from Edison at his winter retreat in Fort Myers, Florida. Edison even contributed technology to the automobile. They were friends until Edison's death. In 1928, Edison joined the Fort Myers Civitan Club. He believed strongly in the organization, writing that "The Civitan Club is doing things —big things— for the community, state, and nation, and I certainly consider it an honor to be numbered in its ranks." He was an active member in the club until his death, sometimes bringing Henry Ford to the club's meetings. Edison was active in business right up to the end. Just months before his death in 1931, the Lackawanna Railroad implemented electric trains in suburban service from Hoboken to Gladstone, Montclair and Dover in New Jersey. Transmission was by means of an overhead catenary system, with the entire project under Edison's guidance. To the surprise of many, he was at the throttle of the very first MU (Multiple-Unit) train to depart Lackawanna Terminal in Hoboken, driving the train all the way to Dover. As another tribute to his lasting legacy, the same fleet of cars Edison deployed on the Lackawanna in 1931 served commuters until their retirement in 1984, when some of them were purchased by the Berkshire Scenic Railway Museum in Lenox, Massachusetts. A special plaque commemorating the joint achievement of both the railway and Edison can be seen today in the waiting room of Lackawanna Terminal in Hoboken, presently operated by New Jersey Transit. Edison was said to have been influenced by a popular fad diet in his last few years; "the only liquid he consumed was a pint of milk every three hours". He is reported to have believed this diet would restore his health. However, this tale is doubtful. In 1930, the year before Edison died, Mina said in an interview about him that "Correct eating is one of his greatest hobbies." She also said that during one of his periodic "great scientific adventures", Edison would be up at 7:00, have breakfast at 8:00, and be rarely home for lunch or dinner, implying that he continued to have all three. Thomas Edison died of complications of diabetes on October 18, 1931, in his home, "Glenmont" in Llewellyn Park in West Orange, New Jersey, which he had purchased in 1886 as a wedding gift for Mina. He is buried behind the home. Mina died in 1947. Edison's last breath is reportedly contained in a test tube at the Henry Ford Museum. Ford reportedly convinced Charles Edison to seal a test tube of air in the inventor's room shortly after his death, as a memento. A plaster death mask was also made. Nonviolence was key to Edison's moral views, and when asked to serve as a naval consultant for World War I, he specified he would work only on defensive weapons and later noted, "I am proud of the fact that I never invented weapons to kill." Edison's philosophy of nonviolence extended to animals as well, about which he stated: "Nonviolence leads to the highest ethics, which is the goal of all evolution. Until we stop harming all other living beings, we are still savages." However, he is also notorious for having electrocuted a number of dogs in 1888, both by direct and alternating current, in an attempt to argue that the former (which he had a vested business interest in promoting) was safer than the latter (favored by his rival George Westinghouse). Edison's success in promoting DC current as less lethal also led to AC current being used in the electric chair adopted by New York in 1889 as a supposedly humane execution method; because Westinghouse was angered by the decision, he funded Eighth Amendment-based appeals for inmates set to die in the electric chair, ultimately resulting in Edison providing the generators which powered early electrocutions and testifying successfully on behalf of the state that electrocution was a painless method of execution. Several places have been named after Edison, most notably the town of Edison, New Jersey. Thomas Edison State College, a nationally known college for adult learners, is in Trenton, New Jersey. Two community colleges are named for him: Edison State College in Fort Myers, Florida, and Edison Community College in Piqua, Ohio. There are numerous high schools named after Edison; see Edison High School. The City Hotel, in Sunbury, Pennsylvania, was the first building to be lit with Edison's three-wire system. The hotel was re-named The Hotel Edison, and retains that name today. Three bridges around the United States have been named in his honor (see Edison Bridge). In West Orange, New Jersey, the 13.5 acre (5.5 ha) Glenmont estate is maintained and operated by the National Park Service as the Edison National Historic Site. The Thomas Alva Edison Memorial Tower and Museum is in the town of Edison, New Jersey. In Beaumont, Texas, there is an Edison Museum, though Edison never visited there. The Port Huron Museum, in Port Huron, Michigan, restored the original depot that Thomas Edison worked out of as a young newsbutcher. The depot has been named the Thomas Edison Depot Museum. The town has many Edison historical landmarks, including the graves of Edison's parents, and a monument along the St. Clair River. Edison's influence can be seen throughout this city of 32,000. In Detroit, the Edison Memorial Fountain in Grand Circus Park was created to honor his achievements. The limestone fountain was dedicated October 21, 1929. The Edison Medal was created on February 11, 1904, by a group of Edison's friends and associates. Four years later the American Institute of Electrical Engineers (AIEE), later IEEE, entered into an agreement with the group to present the medal as its highest award. The first medal was presented in 1909 to Elihu Thomson and, in a twist of fate, was awarded to Nikola Tesla in 1917. It is the oldest award in the area of electrical and electronics engineering, and is presented annually "for a career of meritorious achievement in electrical science, electrical engineering or the electrical arts." In the Netherlands, the major music awards are named the Edison Award after him. Edison was ranked thirty-fifth on Michael H. Hart's 1978 book The 100, a list of the most influential figures in history. Life magazine (USA), in a special double issue in 1997, placed Edison first in the list of the "100 Most Important People in the Last 1000 Years", noting that the light bulb he promoted "lit up the world". In the 2005 television series The Greatest American, he was voted by viewers as the fifteenth-greatest. The United States Navy named the USS Edison (DD-439), a Gleaves class destroyer, in his honor in 1940. The ship was decommissioned a few months after the end of World War II. In 1962, the Navy commissioned USS Thomas A. Edison (SSBN-610), a fleet ballistic missile nuclear-powered submarine. Decommissioned on December 1, 1983, Thomas A. Edison was stricken from the Naval Vessel Register on April 30, 1986. She went through the Navy's Nuclear Powered Ship and Submarine Recycling Program at Bremerton, Washington, beginning on October 1, 1996. When she finished the program on December 1, 1997, she ceased to exist as a complete ship and was listed as scrapped. Thomas Edison has appeared in popular culture as a character in novels, films, comics and video games. His prolific inventing helped make him an icon and he has made appearances in popular culture during his lifetime down to the present day. His history with Nikola Tesla has also provided dramatic tension and is a theme returned to numerous times. ^ Baldwin, Neal (1995). Edison: Inventing the Century. Hyperion. pp. 3–5. ISBN 0-7868-6041-3. ^ "Edison Family Album". US National Park Service. http://www.nps.gov/edis/home_family/fam_album.htm. Retrieved March 11, 2006. ^ "GE emerges world's largest company: Forbes". Trading Markets.com. April 10, 2009. http://www.tradingmarkets.com/.site/news/Stock%20News/2266720/. Retrieved February 7, 2010. ^ "GE emerges world's largest company: Forbes". Indian Express.com. April 9, 2009. http://www.indianexpress.com/news/ge-emerges-worlds-largest-company-forbes/445093. Retrieved February 7, 2010. ^ "U. S. Patent 90,646". Patimg1.uspto.gov. http://patimg1.uspto.gov/.piw?docid=US000090646. Retrieved 2010-01-09. ^ "Older Son To Sue To Void Edison Will; William, Second Child Of The Counsel.". New York Times. October 31, 1931. "The will of Thomas A. Edison, filed in Newark last Thursday, which leaves the bulk of the inventor's $12 million estate to the sons of his second wife, was attacked as unfair yesterday by William L. Edison, second son of the first wife, who announced at the same time that he would sue to break it." ^ The Life of Thomas Edison. American Memory from the Library of Congress. Retrieved March 3, 2009. ^ "Madeleine Edison a Bride. Inventor's Daughter Married to J. E. Sloan by Mgr. Brann.". New York Times. June 18, 1914, Thursday. ^ "Mrs. John Eyre Sloane Has a Son at the Harbor Sanitarium Here.". New York Times. January 10, 1931, Saturday. ^ Evans, Harold, "They Made America." Little, Brown and Company, New York, 2004. ISBN 0-316-27766-5. p. 152. ^ "Moses G. Farmer, Eliot's Inventor". http://www.eliotmaine.org/mosespage.htm. Retrieved March 11, 2006. ^ a b c d e f g Israel, Paul (2000). Edison: A Life of Invention. John Wiley & Sons. ISBN 0471362700. ^ ""Keynote Address – Second International ALN1 Conference (PDF)"". http://64.233.167.104/search?q=cache:aXya_5s0sjEJ:www.sloan-c.org/conference/proceedings/1996/doc/96_gomory.doc+%22We+will+make+electricity+so+cheap+that+only+the+rich+will+burn+candles.%22&hl=en&gl=us&ct=clnk&cd=3&client=firefox-a. ^ "About the Memory of a Theatre". National Theatre Brno. http://www.ndbrno.cz/en/about-us/theatre-buildings/mahen-theatre/history-of-mahen-theatre/history-mt/. Retrieved December 30, 2007. . Retrieved September 18, 2007. ^ "IMDB entry on Electrocuting an Elephant (1903)". http://imdb.com/title/tt0231523/. Retrieved March 11, 2006. ^ "Wired Magazine: "Jan. 4, 1903: Edison Fries an Elephant to Prove His Point"". http://www.wired.com/science/discoveries/news/2008/01/dayintech_0104?. Retrieved January 4, 2008. ^ "Electrocution Thresholds for Humans". http://www.bassengineering.com/E_Effect.htm. Retrieved February 26, 2009. ^ Tony Long (January 4, 2008). "Jan. 4, 1903: Edison Fries an Elephant to Prove His Point". AlterNet. http://www.wired.com/science/discoveries/news/2008/01/dayintech_0104. Retrieved January 4, 2008. ^ Lee, Jennifer (November 14, 2007). "Off Goes the Power Current Started by Thomas Edison". The New York Times Company. http://cityroom.blogs.nytimes.com/2007/11/14/off-goes-the-power-current-started-by-thomas-edison/. Retrieved December 30, 2007. ^ Duke University Rare Book, Manuscript, and Special Collections Library: Edison fears the hidden perils of the x-rays. New York Worldb/, Aug 3, 1903, Durham, NC. ^ "The Thomas A. Edison Papers". Edison.rutgers.edu. http://edison.rutgers.edu/. Retrieved January 29, 2009. ^ "Tesla – Master of Lightning:Coming to America". http://www.pbs.org/tesla/ll/ll_america.html. Retrieved March 11, 2006. ^ "Tesla Says Edison was an Empiricist. Electrical Technician Declares Persistent Trials Attested Inventor's Vigor. 'His Method Inefficient' A Little Theory Would Have Saved Him 90% of Labor, Ex-Aide Asserts. Praises His Great Genius.". New York Times. October 19, 1931. "Nikola Tesla, one of the world's outstanding electrical technicians, who came to America in 1884 to work with Thomas A. Edison, specifically in the designing of motors and generators, recounted yesterday some of ..."
^ "History of Edison Motion Pictures". http://memory.loc.gov/ammem/edhtml/edmvhist.html. Retrieved October 14, 2007. ^ "Martin Loiperdinger. ''Film & Schokolade. Stollwercks Geschäfte mit lebenden Bildern ''. KINtop Schriften Stroemfeld Verlag, Frankfurt am Main, Basel 1999 ISBN 3-87877-764-7 (Buch) ISBN 3-87877-760-4 (Buch und Videocassette". Victorian-cinema.net. http://www.victorian-cinema.net/stollwerck.htm. Retrieved January 29, 2009. ^ "Guido Convents, ''Van Kinetoscoop tot Cafe-Cine de Eerste Jaren van de Film in Belgie, 1894–1908, pp. 33–69.'' Universitaire Pers Leuven. Leuven: 2000. Guido Convents, "'Edison's Kinetscope in Belgium, or, Scientists, Admirers, Businessmen, Industrialists and Crooks", pp. 249–258. in C. Dupré la Tour, A. Gaudreault, R. Pearson (Ed.) ''Cinema at the Turn of the Century''. Québec, 1999". Imdb.com. http://www.imdb.com/company/co0111244/. Retrieved January 29, 2009. ^ "Thomas Edison". Greater Sudbury Heritage Museums. http://www.sudburymuseums.ca/index.cfm?app=w_vmuseum&lang=en&currID=2031&parID=2029. Retrieved December 30, 2007. ^ Holland, Kevin J. (2001). Classic American Railroad Terminals. MBI Publishing Company. ISBN 0760308322. ^ Benoit, Tod (2003). Where are they buried? How did they die?. Black Dog & Leventhal. p. 560. ISBN 1-57912-678-2. ^ "Is Thomas Edison's last breath preserved in a test tube in the Henry Ford Museum? ", The Straight Dope, 11-Sep-1987. Retrieved August 20, 2007. ^ ""No Immortality of the Soul" says Thomas A. Edison. In Fact, He Doesn't Believe There Is a Soul — Human Beings Only an Aggregate of Cells and the Brain Only a Wonderful Machine, Says Wizard of Electricity.". New York Times. October 2, 1910, Sunday. "Thomas A. Edison in the following interview for the first time speaks to the public on the vital subjects of the human soul and immortality. It will be bound to be a most fascinating, an amazing statement, from one of the most notable and interesting men of the age ... Nature is what we know. We do not know the gods of religions. And nature is not kind, or merciful, or loving. If God made me — the fabled God of the three qualities of which I spoke: mercy, kindness, love — He also made the fish I catch and eat. And where do His mercy, kindness, and love for that fish come in? No; nature made us — nature did it all — not the gods of the religions." ^ Bellis, Mary. "Death, Money, and the History of the Electric Chair". About.com. http://inventors.about.com/od/hstartinventions/a/Electric_Chair.htm. Retrieved February 23, 2010. "On January 1, 1889, the world's first electrical execution law went into full effect. Westinghouse protested the decision and refused to sell any AC generators directly to prison authorities. Thomas Edison and Harold Brown provided the AC generators needed for the first working electric chairs. George Westinghouse funded the appeals for the first prisoners sentenced to death by electrocution, made on the grounds that "electrocution was cruel and unusual punishment." Edison and Brown both testified for the state that execution was a quick and painless form of death and the State of New York won the appeals." ^ "Edison Community College (Ohio)". Edison.cc.oh.us. http://www.edison.cc.oh.us/. Retrieved January 29, 2009. ^ "Thomas A. Edison Patent Award". American Society of Mechanical Engineers. http://www.asme.org/Governance/Honors/SocietyAwards/Thomas_Edison_Patent_Award.cfm. Clark, Ronald William (1977). Edison: The man who made the future. London: Macdonald & Jane's: Macdonald and Jane's. ISBN 0-354-04093-6. Essig, Mark (2004). Edison and the Electric Chair. Stroud: Sutton. ISBN 0-7509-3680-0. Pretzer, William S. (ed). (1989). Working at Inventing: Thomas A. Edison and the Menlo Park Experience. Dearborn, Michigan: Henry Ford Museum & Greenfield Village. ISBN ISBN 0-933728-33-6. Thomas Alva Edison (1847-02-11 – 1931-10-18) was an American inventor and businessman who developed many devices which greatly influenced life worldwide into the 21st century. Cited in Innovate Like Edison: The Success System of America's Greatest Inventor by Sarah Miller Caldicott, Michael J. Gelb, page 37, . Variant forms without early citation: "Genius is one per cent inspiration and ninety-nine per cent perspiration. Accordingly, a 'genius' is often merely a talented person who has done all of his or her homework." Response to the idea that he had failed after 10,000 experiments to develop a storage battery, as quoted in The World Book Encyclopedia (1993) Vol. E, p. 78; there are many variants on this quote, with the numbers mentioned ranging from 97 to 10,000. Results! I have gotten a lot of results. I know several thousand things that won't work. We have only found 586 ways that won't work and won't have to be tried again. Soon, we will find one that does. Failed? — why we haven't failed, we only know the thousands of ways that won't work. If our nation can issue a dollar bond, it can issue a dollar bill. The element that makes the bond good, makes the bill good also. The difference between the bond and the bill is the bond lets money brokers collect twice the amount of the bond and an additional 20%, where as the currency pays nobody but those who contribute directly in some useful way. It is absurd to say our country can issue $30 million in bonds and not $30 million in currency. Both are promises to pay, but one promise fattens the userers and the other helps the people. "Is Thomas Edison's last breath preserved in a test tube in the Henry Ford Museum?" - The Straight Dope: Is Thomas Edison's last breath preserved in a test tube in the Henry Ford Museum? Invention City - Did Edison Knock Off the Light Bulb?